Salvinorin A is the main active psychotropic molecule in Salvia divinorum, a Mexican plant which has a long history of use as an entheogen by indigenous Mazatec shamans. Salvinorin A is considered a dissociative exhibiting atypically psychedelic effects. It is structurally distinct from other naturally occurring hallucinogens (such as DMT, psilocybin, and mescaline) because it contains no nitrogen atoms; hence, it is not an alkaloid (and cannot be rendered as a salt) but a terpenoid. It also differs in subjective experience, compared to other hallucinogens, and has been described as dissociative. Salvinorin A is found with several other structurally related salvinorins. Salvinorin is a trans-neoclerodane diterpenoid. It acts as a kappa opioid receptor agonist and is the first known compound acting on this receptor that is not an alkaloid. Salvinorin A was first described and named in 1982 by Alfredo Ortega and colleagues in Mexico. They used a combination of spectroscopy and x-ray crystallography to determine the chemical structure of the compound, which was shown to have a bicyclic diterpene structure. Around the same time, Leander Julián Valdés III independently isolated the molecule as part of his PhD research, published in 1983. Valdés named the chemical divinorum, and also isolated an analog that he named divinorum B. The naming was subsequently corrected to salvinorin A and B after the work was published in 1984. Valdés later isolated salvinorin C.
Salvinorin A is a trans-neoclerodane diterpenoid with the chemical formula C23H28O8. Unlike other known opioid-receptor ligands, salvinorin A is not an alkaloid as it does not contain a basic nitrogen atom. Salvinorin A has no action at the 5-HT2A serotonin receptor, the principal molecular target responsible for the actions of 'classical' psychedelics such as LSD and mescaline. 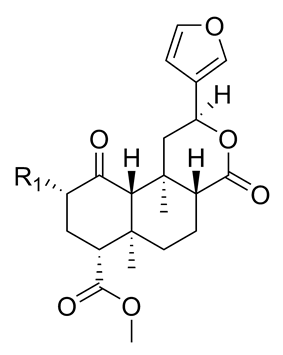 Salvinorin A is active at doses as low as 200 µg. Synthetic chemicals, such as LSD (active at 20–30 µg doses), can be more potent. Research has shown that salvinorin A is a potent κ-opioid receptor agonist. It has a high affinity for the receptor, indicated by the low dissociation constant of 1.0 nanomolar (nM). It has been reported that the effects of salvinorin A in mice are blocked by κ-opioid receptor antagonists. In addition, salvinorin A has recently been found to act as an even more potent D2 receptor partial agonist, with an affinity of 5–10 nM, an intrinsic activity of 40–60%, and an EC50 of 48 nM, which is almost five times higher than its EC50 of 235 nM for the κ-opioid receptor. This suggests that the D2 receptor may also play an important role in its effects. 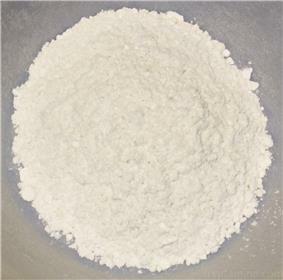 Salvinorin A is unique in that it is the only naturally occurring substance known to induce a visionary state via this mode of action; there are synthetic kappa-opioid agonists, (e.g. enadoline, ketazocine, pentazocine and relatives), which show similar hallucinatory and dissociative effects. Salvinorin A is capable of inhibiting excess intestinal motility (e.g. diarrhea), through its potent k-opioid-activating effects. The mechanism of action for salvinorin A on ileal tissue has been described as 'prejunctional', as it was able to modify electrically induced contractions, but not those of exogenous acetylcholine. A pharmacologically important aspect of the contraction-reducing properties of ingested salvinorin A on gut tissue is that it is only pharmacologically active on inflamed and not normal tissue, thus reducing possible side-effects. Salvinorin A is soluble in ethanol and acetone, but not especially so in water. It is possible Salvinorin A may also be soluble in lipids as are some related terpenoids such as cannabinoids and curcuminoids. Many other terpenoids have been isolated from Salvia divinorum, including other salvinorins and related compounds named divinatorins and salvinicins. None of these compounds have shown significant (sub-micromolar) affinity at the kappa-opioid receptor, and there is no evidence that they contribute to the plant's psychoactivity. The biogenic origin of salvinorin A synthesis has been elucidated using nuclear magnetic resonance and ESI-MS analysis of incorporated precursors labeled with stable isotopes of carbon (Carbon-13 13C) and hydrogen (Deuterium 2H). It "is biosynthesized via the 1-deoxy-d-xylulose-5-phosphate pathway," rather than the classic mevalonate pathway typical for plant terpenoids. Terpenoids are biosynthesized from two C5 precursors, isopentenyl diphosphate (IPP) and dimethylallyl diphosphate (DMAPP). The NMR and MS study by Zjawiony suggested that the biosynthesis of salvinorin A proceeds via the 1-deoxy-d-xylulose-5-phosphate pathway. In the deoxyxylulose phosphate pathway, D-glyceraldehyde 3-phosphate and pyruvate, the intermediates of the glycolysis, are converted into 1-deoxy-D-xylulose 5-phosphate via decarboxylation. Subsequent reduction with NADPH generates 2C-methyl-D-erythritol 2,4-cyclodiphosphate, via the intermediates 4-diphosphocytidyl-2-C-methyl-D-erythritol and 4-diphosphocytidyl-2c-methyl-d-erythritol-2-phosphate, which then lead to IPP and DMAPP. The allylic cation generated by the ionization of DMAPP yields geranyl diphosphate (GPP), a monoterpene diphosphate with the newly formed double bond in trans. Subsequent addition of IPP generates a diterpene, geranylgeranyl diphosphate (GGPP). Cyclization via electrophilic addition of the GGPP affords Iabdanyl cation. Upon the further rearrangements of the methyl groups and hydrides, clerodane pyrophosphate was generated. 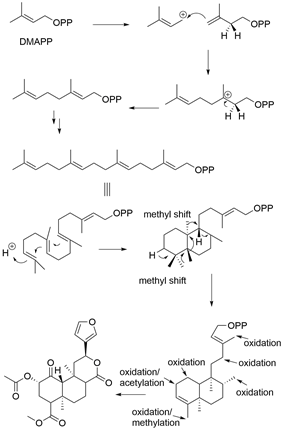 Additional oxidation and cyclization clerodane pyrophosphate concludes the biosynthesis of salvinorin A. A total asymmetric synthesis of salvinorin A, which relies on a transannular Michael reaction cascade to construct the ring system, was achieved in 2007 by Evans and co-workers in 4.5% overall yield over 30 steps. 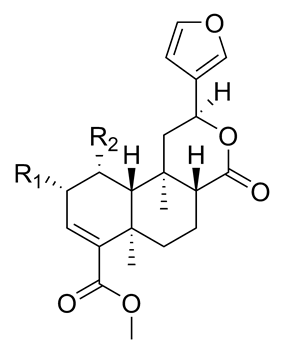 More recently, a synthesis was published by a Japanese group, requiring 24 steps to yield salvinorin A in 0.15% yield. An approach to the trans-decalin ring system of salvinorin A has been described by Forsyth (et al.) utilizing an intramolecular Diels-Alder reaction/Tsuji allylation strategy. An attempt at the synthesis of salvinorin A has also been published by a group at RMIT University, adopting a convergent synthesis of a functionalized cyclohexanone with a α,β-unsaturated lactone. Salvinorin A is one of several structurally related salvinorins found in the Salvia divinorum plant. Salvinorin A can be synthesized from the inactive salvinorin B by acetylation. The de-acetylated analog salvinorin B is devoid of human activity. It was speculated that salvinorin C might be even more potent than salvinorin A, but human tests and receptor binding assays could not confirm this. Salvinorin A seems to be the only active naturally occurring salvinorin. The newly discovered salvinorin J is most closely related to salvinorin E in structure, with a C-17 secondary alcohol instead of a ketone group. Research on salvinorin derivatives has produced a number of semi-synthetic compounds, several of which can be conveniently made from salvinorin B. Most derivatives are selective kappa opioid agonists as with salvinorin A, although some are even more potent, with the most potent compound 2-ethoxymethyl salvinorin B being 10x stronger than salvinorin A. A few derivatives such as herkinorin have reduced kappa opioid action and instead act as mu opioid agonists. Salvinorin A has only been administered to humans in a few studies. One such study found that its effects peak at about 2 minutes, that its subjective effects overlap with those of serotonergic psychedelics, and that it temporarily impairs recall and recognition memory. Results from a small study by an assistant professor at the University of Iowa indicate that it may have potential as an analgesic and as a therapeutic tool for treating drug addictions. κ-opioid agonists have very marked effects on all types of addiction including alcohol, cocaine, and opiate abuse. Salvinorin A is not scheduled at the federal level in the United States. Its molecular structure is unlike any Schedule I or II drug, so possession or sales is unlikely to be prosecuted under the Federal Analog Act. "Salvinorin A" is a Schedule I controlled substance in the state of Florida making it illegal to buy, sell, or possess in Florida. There is an exception however for "any drug product approved by the United States Food and Drug Administration which contains Salvinorin A or its isomers, esters, ethers, salts, and salts of isomers, esters, and ethers, if the existence of such isomers, esters, ethers, and salts is possible within the specific chemical designation." Sveriges riksdags health ministry Statens folkhälsoinstitut classified Salvinorin A (and Salvia divinorum) as "health hazard" under the act Lagen om förbud mot vissa hälsofarliga varor (translated Act on the Prohibition of Certain Goods Dangerous to Health) as of Apr 1, 2006, in their regulation SFS 2006:167 listed as "salvinorin A", making it illegal to sell or possess. ^ Note: the Mowry et al. study used the following data: 1600 μg/kg (0.0016 mg/g) daily injections for 14 days on "Swiss-Webster mice, aged 4–6 months" of unknown weight (when purchasing mice, an estimated maximum mass is 25 g). Given that the average weight for males in the United States is 190.9 lbs (according to WorldHeritage), or 86,590.7834 g, and that a single gram mixture of plain leaf contains roughly 3 mg/g of Salvinorin A (according to Daniel Siebert), this translates to the mice receiving an effective dose of roughly 6,494,309 times more than a human (human doses range from minimal, 200 μg, to upwards of 24 mg, and body weights for both humans and mice vary tremendously). ^ "A peltate glandular trichome on the abaxial leaf surface", and "The fact that most of the salvinorin content of fresh leaves can be extracted into chloroform without the solvent penetrating the epidermis indicates that these compounds are secreted externally to the epidermis." Tryptamind Salvinorin A Downloadable salvinorin extraction photos.